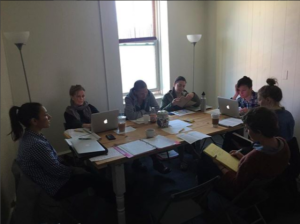 Kingston Writers’ Studio is a dedicated writers’ co-working space in Kingston, NY, which also offers workshops and events. Located in the heart of Uptown Kingston, in the Opera House Building at 275 Fair Street, Kingston Writers’ Studio is a place for writers of various stripes to focus and get work done without feeling isolated. 1. Full-time, at $100/month with a 1-year committment; $110/month with a half-year committment, $115/month with a quarterly committment. 2. Part-time, with four visits per month, at $50/month with a 1-year committment; $55/month with a half-year committment, $57.50 with a quarterly committment. Visiting writers are welcome at a rate of $15/day or $75/week. 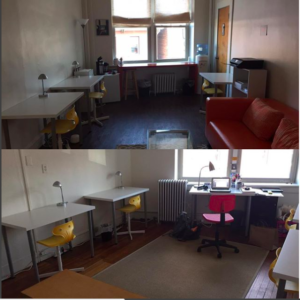 There are two co-working rooms with ten desks and two couches, and a workshop room with a large table. There’s dedicated high-speed business-class wifi, complimentary coffee and tea and spring water. There’s a wifi printer, and members get complimentary printing/copying of up to 50 pages per month. Authors Alexander Chee and Alana Massey will read briefly from their essay collections, and discuss the nature of these books with Longreads Essays Editor Sari Botton. Alana Massey is the author of the essay collection, “All The Lives I Want: Essays About My Best Friends Who Happen To Be Famous Strangers.” She writes about culture, identity, vice, and virtue and lives in The Catskills.